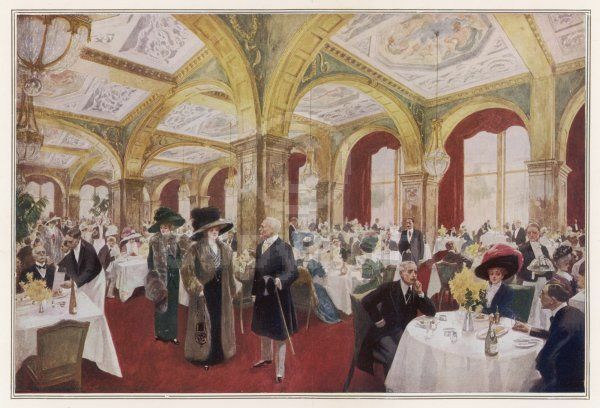 Throughout the nineteenth and early twentieth centuries, the well-to-do sat down to dinners of alarming richness. The modern vegetarian movement was a reaction to this, and was derived from the Age of Enlightenment, which emphasized the questioning of traditional institutions, customs and morals, and the recognition of the need for major reformation of the human condition. One the earliest vegetarians of the nineteenth century was Percy Bysshe Shelley, who converted to the meat-less diet in 1812. Fervent in his renunciation of meat consumption, he also added a political dimension to the cause, citing meat production–which then was the reserve of the privileged–as a reason for food shortages among society’s most needy. The London Food Reform Society was formed in 1877, with baker Dr. T.R. Allinson one of its founding members. The two societies merged in 1885, with the LFRS becoming the London branch of The Vegetarian Society until 1888, when there was a breakaway and the formation of The London Vegetarian Society, with its own publication — The Vegetarian. In 1889 the Vegetarian Federal Union was established with the aim of bringing together all vegetarian societies, local, national and overseas. 1897 saw the second International Congress in London. The International Vegetarian Union succeeded the Vegetarian Federal Union in 1908, and a Congress was held in Nice. Since then, Congresses have taken place in many parts of the world. 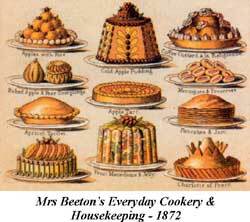 By the 1880s vegetarian restaurants were popular in London, offering cheap and nutritious meals in respectable settings, and vegetarian cookbooks abounded. Found in every quarter of the town, the names were cheerful, such as the Apple Tree, within the City precincts, The Orange Grove in St Martin’s Lane, The Porridge Bowl in Holborn, The Rose, Finsbury Way, The Waverley in the Borough, and not far from Oxford Street, the Wheatleaf. Porridge was one of the mainstays of the vegetarian regime and the choices afforded included maize-mash and wheaten porridge; but the piece de resistance was, naturally, the Scotch oatmeal. Other recipes available included: vegetable goose, stuffing minus the bird; lentil cutlet with tomato sauce; steak-pie in a vegetable form; rump-steak from pot herbs; and macaroni, in various forms, was always in favor. With desserts, there were few things which could not be made on vegetarian principles–though suet was not allowed, plum pudding could be made without it–plum porridge, made of boiled wheat, sweetened and spiced, and with raisins. By the standards set by the Vegetarian Society, all food was cooked with all vegetable salts retained, and with no salt, soda or other substances added. Passing up a flight of stairs we entered a large, cheerful-looking room, tastefully and quietly decorated, and lit by incandescent electric lamps…vegetable soup; lentil cutlets with tomato sauce–shaped like regular cutlets of meat, and were beautifully browned. Mashed potatoes with the cutlets; finished with a pot of tea. Cost 12 pence (24 American cents) and a penny for the napkin. At Furnivall Street, just off Holborn, a short flight of steps leads one into the spotless front hall of the Food Reform Restaurant. In the office to the right the smiling cashier offers you a small pamphlet of Dietetic Hints or a package of sample menus. At attention are trim waitresses in blue gowns, white caps and aprons. Plain course dinner for one shilling: Choice of soup or porridge…3 pence; a savory…5 pence; a sweet…3 pence; cheddar cheese or fruit; coffee or lemonade. Savory is a compound of nuts or vegetables with a sauce, or of two or three vegetables cooked together such as Rice Milanaise, Baked Potatoes, Turnip Tops, or Haricot Fritters, Tomato Sauce and Baked Potatoes. 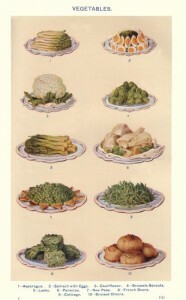 Fresh vegetables in season, cooked, a specialty: choice of cauliflower, grilled tomatoes, spring cabbage, potatoes in four different ways for 2 pence; boiled parsnips, and a selection of three for 5 pence. Great attraction of the house is its sixpenny teas. A cup costs 2 pence, a pot 6 pence. A roll is 1 pence and butter is also pence. This restaurant is liberal: offers watercress, scones, preserves, buttered tea cake, ripe fruit. From the following, more luxurious Vegetarian luncheon, one may suspect that it was not only the carnivores who made an annual retreat to Marienbad or the cheaper Brighton: Purée de Céleri à la crème; Omlettes aux tomates; œufs durs au gratin; Risotto milanaise; Asperges; Sauce hollandaise; Salade de légumes; Crème caramel renversée; Pommes à la royale; Fromage. Listed in Mrs. Mill’s Reform Cookery Book were the addresses of vegetarian and health food stores, where the Edwardian vegetarian could shop for Hovis health bread or flour, vegetable meats, Muesli, or other vegetable- or nut-based products. In London, the selection of stores included The Food Reform Restaurant, J.F. Croal, and Mapleton’s Nut Food Company. Vegetarian stores were available in cities such as Birmingham, Bristol, Leeds, Liverpool and Manchester–such as the Pitman Stores in Birmingham and Chapman’s Health Foods Depot in Liverpool. Even Scottish vegetarians were able to shop wisely and healthily in such stores as Edinburgh’s Heath Foods Depot, and Glasgow’s The Health Food Supply. It seems a bit funny that a movement we consider to be “modern” had its roots in the “repressed” Victorian days, but the more I research, the more I see that our society has a much deeper tie to our past than we realize. Another fascinating post. I know that George Bernard Shaw was a vegetarian which may have contributed to his long life. I resolve to have at least one vegetarian character in my next WIP! Probably a secondary character, because I don’t if the world is ready for a vegetarian historical hero. I think it can be done, but I have a suspicion that some readers might think you’re pushing an agenda rather than adding a historical tidbit to your character! This was very enlightening. I always thought vegetarianism started back in the 60s or 70s with hippies, but I see my thoughts were wrong. Very good post, and thanks for adding a link to my blog.